SLI-FI is a game that demonstrates the merit and integral necessity of mobile gaming. It is a physics game that could not exist fully on any other device without losing its charm. In SLI-FI you control a small green square that jumps between planets, trying to get to the necessary portal to take you to your next system. Each planet has its own gravity well that traps objects within it. This means that to progress in the level, you need to time and measure the intensity of your jumps so as to actually land yourself on each planet. If you miss the gravity well, then you fly into space for all eternity. The controls utilize your phone’s orientation for movement. Turning your phone left and right controls your character moving along the sphere of whatever planet he’s standing on. To jump you simply tap the screen, holding it for longer to give greater jump intensity. Because each planet has its own gravitational force, and because it’s quite easy to miss the gravity well entirely, the game is a constant experimentation. The physics of SLI-FI is extraordinarily detailed; not only do you need to manage to land within the gravity well, you can be caught in a slingshot maneuver, exactly as actual astronauts use to get around planets. Many times you’ll find yourself just missing hitting the planet and instead whip around the sphere and be propelled outside of the gravity well to float into endless space. Although you obviously die horribly, what a cool and scientific way to go! 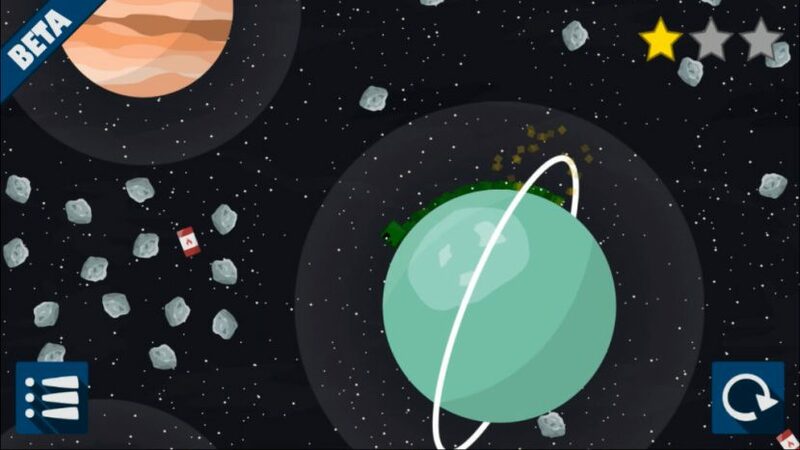 In between the planets there are a variety of asteroids and oddly placed explosive barrels. Frequently you will find yourself mashed up against a space rock, losing all your momentum and be completely unable to move – you can’t jump far if what you’re standing on has no gravity, after all. However, any time you find yourself within a gigantic field of asteroids, using the delightfully red explosive barrels will usually clear the asteroids out of the way. For a simple physics game, SLI-FI has some surprisingly funny and intense moments. Sometimes the scattered space rocks blown away by the explosive barrels will find themselves caught in the gravity well of the planet you’re trying to get to. Suddenly, you’ll be sprinting ahead of a series of gigantic asteroids barreling around the entire planet, attempting to knock you off while you attempt to move into the correct position and jump away. Frequently you will find yourself mashed up against a space rock, losing all your momentum and be completely unable to move – you can’t jump far if what you’re standing on has no gravity, after all. In the later levels there exists red, evil imitations of you that move mindlessly around planets, blocking you and killing you if you touch them. This gradual increase of difficulty through obstacles adds continuing depth to SLI-FI and means that each progressive level remains fun and engaging. While the gameplay of SLI-FI is extraordinary, it’s hard to play the game without wondering what kind of life this adorable green square lives. Jumping between planets, seemingly crushing its inhabitants constantly due to its relatively massive size, searching for exit portals only to, once again, arrive at a different system and do it all again. Is SLI-FI the story of an experiment gone wrong? An insane, devouring beast that desires to destroy all life in the universe? That question will haunt me forever. Luckily, the game is good enough that you’ll forget about it and just enjoy yourself. For the little green square though?